Grove Under has been using Tradervue for quite some time, and last week he wrote a post called Using Tradervue for analysis of autotrading The Lincoln Million. Basically he has been autotrading a system for the last couple of months, and he goes into some analysis of it using Tradervue. This chart yields quite a bit of insight into how the system has been working, and possible ways to improve it…and he’s got a lot more where this came from. I encourage you to go read the entire post – there are some great nuggets of analysis wisdom in it! For futures traders, we have added the ability for all of the reports to display P&L data in ticks rather than $ (or R). When you visit the reports, you will now see an additional available mode, depending on your subscription. 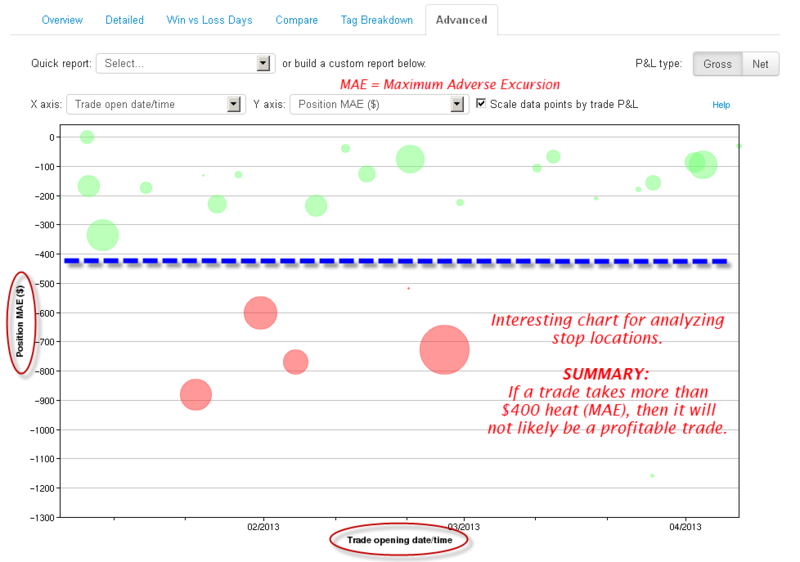 Clicking the “T” will switch all P&L values in the reports to be in ticks, rather than $. Only futures trades will be shown in tick mode. Other trades will not appear in the reports when in this mode. While each trade may have a different tick size (e.g. ES vs CL trades), the reporting normalizes them to just “ticks”. So if you made 2 ticks in an ES trade, and 5 ticks in a CL trade, the combined P&L for the two trades will be displayed as 7 ticks. Tick reporting is available today for all futures trades! The new Recent report group on the Overview reports has been very popular since its introduction a couple of months ago. While most of the interactive reports in Tradervue require a silver or gold subscription, this one is enabled for all users! Many of you are using the Tradervue workflow where you create new manual trades (e.g. click “New Trade”) during the day to make notes, and then import your execution data later to match up with those trades. 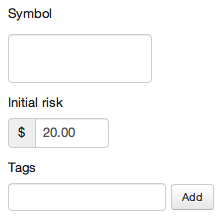 If you have a default per-trade risk defined (in your Trade Settings), that value will be pre-populated for you. This should streamline the workflow for users manually creating trades during the day who are also using the risk management functionality of the Gold plan! We have added options support for traders using Scottrade. As always, log into Tradervue, click Import Trades, select Scottrade, and follow the instructions! Sharing trades on Tradervue has proven to be quite popular, and more and more traders are sharing some of their trades with the community. As a result of this growing interest, we have made some changes to the way the shared trades pages work. A – The shared trades pages will no longer show trades that have no notes. We have found that these trades rarely get comments, and are viewed far less than trades where the trader has made notes. So, from now on, trades that are shared with no notes will not show on the main Shared Trades pages, nor on the Tradervue front page. These trades with no notes will still show up on the trader’s personal shared trades page. B – You can now search for a trader. If you know a trader’s username on Tradervue, enter it and click Search and you can go their personal shared trades page. 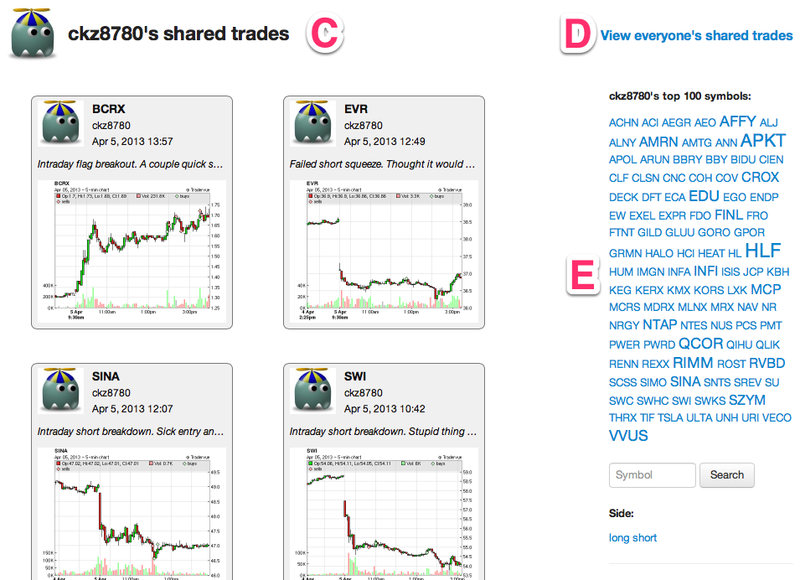 C – We have re-worked the page for viewing a particular user’s trades (example). On this personal page, the trader’s username and avatar are now shown in the upper left, so you know you’re viewing trades for just this user. D – From a trader’s personal shared trades page, you can click “View everyone’s shared trades” to go back to the main Shared Trades page. E – On the personal shared pages, we now show the top 100 symbols for that user, based on how many trades with those symbols are shared. If you click on one of those symbols, you will then see only trades from that user for that symbol. 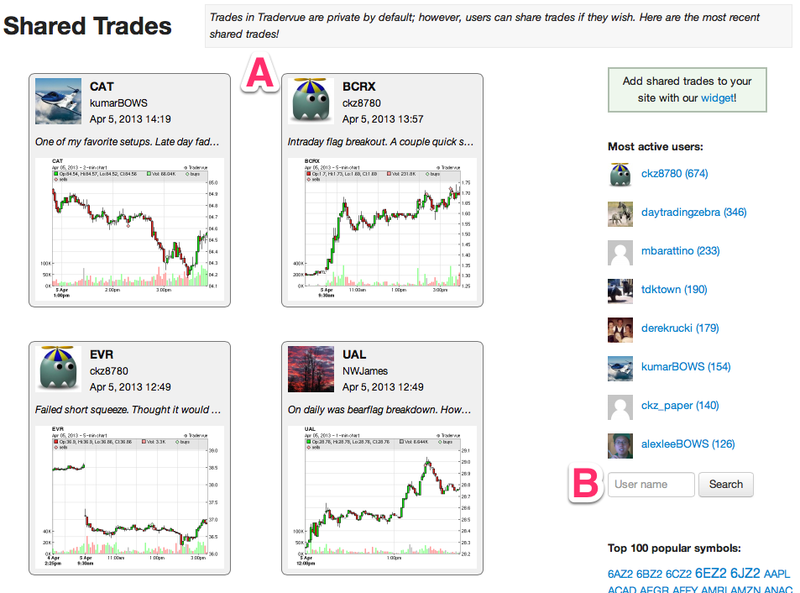 All in all, we’ve made it much easier to find users on Tradervue, and to browse through their trades. If you have any suggestions, we’d love to hear them! If you’re using FXCM Trading Station, you are now in luck…Tradervue now supports importing trading data from FXCM. Just go to the Import Trades page, select FXCM Trading Station, and follow the instructions. And if you’re using MT4 with FXCM, select MetaTrader (MT4) from the list instead. The first three are self-explanatory; these were actually available before in the Win/Loss/Expectation sub-group, but they are important enough that we have moved them up into the statistics tables. Here, our average trade P&L is $4.10, but our standard deviation is a whopping $27.81 – almost 7 times the average. This suggests that our performance with these trades might well be little more than luck. In this case, the average is much higher in relation to the standard deviation, and thus our performance on this set of trades is likely more statistically significant. These new statistics are available today for all users!